Tail docking of pigs is under scrutiny due to concerns about animal welfare. To reevaluate the consequences of raising pigs without tail docking under modern, commercial-like conditions, a study was conducted to compare welfare, behavior, and performance of pigs with and without tail docking. Pigs farrowed to 37 sows were used with half of each litter tail-docked (docked) after birth and remaining pigs left with tails intact (intact). During the nursery period, pigs (n = 336, initial wt = 7.8 ± 1.5 kg) were housed in 20 docked pens and 22 intact pens (8 pigs/pen). During the growing-finishing period, pigs (n = 240, initial wt = 24.9 ± 2.9 kg) were housed in 8 pens (4 pens each of docked and intact, 30 pigs/pen) for 16 wk (avg final wt = 126.2 ± 10.3 kg). Weight gain and feed intake were recorded. 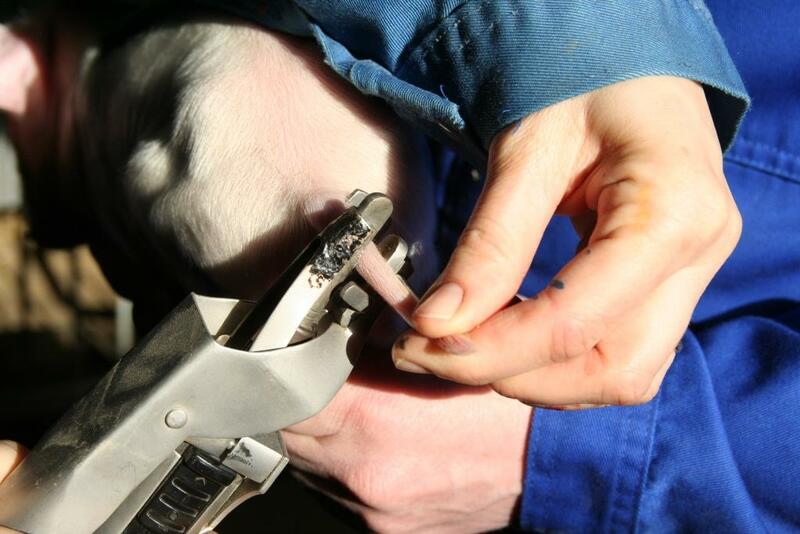 All pigs were assessed for tail damage and skin lesions every 4 wk and during outbreaks of tail biting. Behaviors were video-recorded twice weekly for 13 wk during the growing-finishing period. Carcass weights and incidence of carcass trim loss were recorded. More intact pigs experienced tail damage during both nursery (41% vs. 2%; chi-square = 75.7; P < 0.0001) and growing-finishing (89% vs. 48%; chi-square = 76.2; P < 0.0001) periods than docked pigs. Intact pigs spent more time tail biting (0.31% vs. 0.06%; P < 0.001) and tended to spend less time drinking (1.58 vs. 1.77%; P < 0.10) compared to docked pigs. 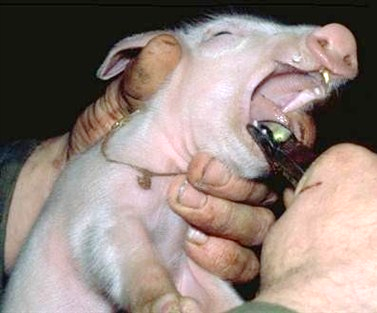 Intact pigs experienced the first outbreak of tail biting at 11 wk of age, which occurred 6 wk earlier compared to docked pigs. Furthermore, 21% of intact pigs vs. 5% (P < 0.001) of docked pigs were removed due to tail damage. Tail docking did not affect ADG (nursery: 0.48 vs. 0.49 kg, SE = 0.04; growing-finishing: 0.86 vs. 0.87 kg, SE = 0.01 for docked and intact pigs, respectively) or skin lesions of pigs. For pigs that were not removed, ADFI was not different between pens with docked pigs and pens with intact pigs. As a consequence of carcass trim loss, carcass contamination, and mortality, 90% of intact pigs vs. 97% of docked pigs were harvested for full value. These data suggest that raising pigs without tail docking in a confinement housing system increases incidence of tail biting and tail damage, resulting in higher morbidity, reduced value, and compromised welfare of pigs.